SendBlaster 2.0: New Features Revealed! SendBlaster 2: New Features Revealed! We’ve recently announced that SendBlaster 2 will be available soon. It will include many exciting new features based on users requests, that will help you to manage your email marketing campaigns better than ever. For the first time we are going to reveal them! SendBlaster 2 has a button in the compose message to add a customize unsibscribe link inside the message (as required by the CAN-SPAM Act). You may schedule messages to be sent in the future. SendBlaster now integrates the “Spam check” tool. It incorporates all the SpamAssassin rules that you need to respect to go straight to your customer’s inbox. SendBlaster + Google Analytics! It means that you may measure the effectiveness of your email marketing campaigns. Easily and for free. We give you a service to manage advanced analysis on the effectiveness of your campaigns. Discover how you can check if your customers open/read your messages and if they clicked on any link. Dozens of new HTML templates you can easily modify. Our free service permits you to collect data directly inside SendBlaster lists. Learn how to collect data inside our bulk email software. You may save different configurations of settings, for istance for different mailings, different smtp settings or different email sender. It is very usfeull if you send newsletter on behalf of your customers. 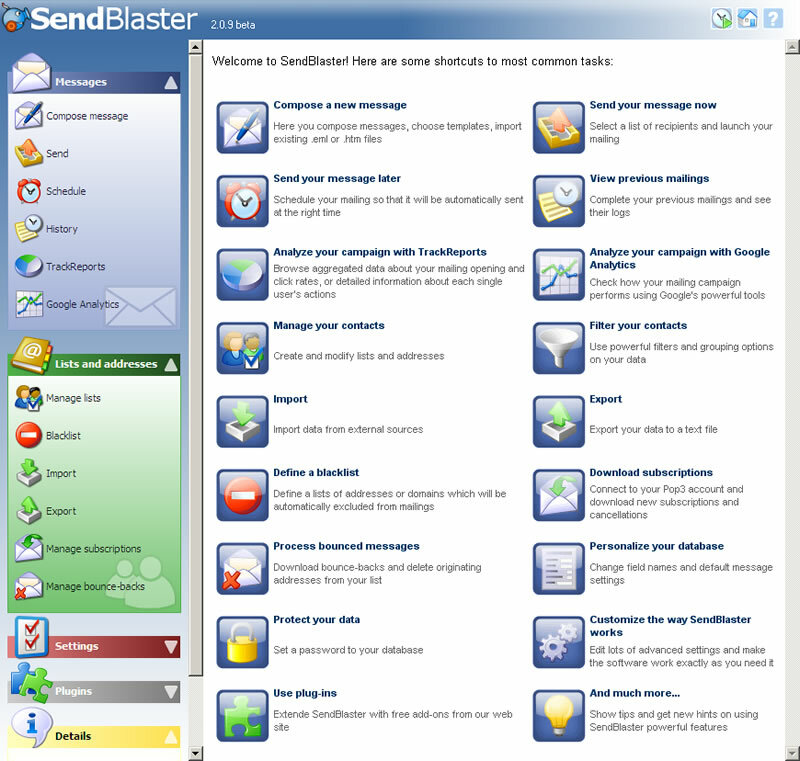 You may use third-party software developed for SendBlaster. At this moment we have plugins for making a backup, importing from Thunderbird and Outlook. Setting these fields and clicking on ‘preview’, you may see how newsletter appears with data included. You may build custom queries in the database. It’s very useful if you want to sort information on base of values of fields or profile the database in order to send the message to a precise target. All customers who purchased SendBlaster Pro after July 1, 2009 will be eligible for FREE SendBlaster PRO 2 upgrade. I think this great! so this means the new edition is not available right? when are you going to make it available? we expect it to be out by October, maybe even earlier depending on the beta tests. stay tuned! I just tried the free version this morning, I am ready for the PRO version, but not until I see how one can identify the namne of the list one wants to send. Such a basic thing to be missing . . . or maybe I am missing something. Anyone here know the answer??? I have some problems using SendBlaster. When I attach more than one picture in the same line and try to hyperlink eatch one of them to differents urls, the Send Blaster always join the hyperlinks into one or two and erases others. Have you any correction to this? 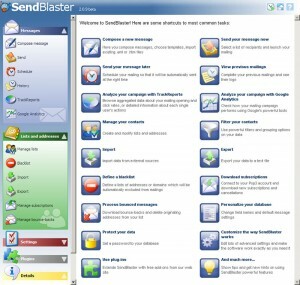 Will there be an OSX version of Sendblaster 2.0? I’m glad you’re happy with our software! < Template Design Contest – Win SendBlaster PRO 2!